Z1 helmet for sale - $75 plus shipping. Size is very small. Used very little - very good shape. Everything works - front button, visor and sizing cord. Made for a very small head. A different liner could be put in, but shell is small. cfworldrecord.com has a hi-res video. don't know if you can download it though. Seven Hills Skydivers is a not for profit, all volunteer, member owned club. 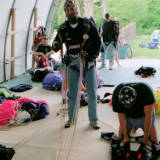 We are in business to promote skydiving and introduce people to the sport by training students and performing demo jumps, and have been in existence since 1962. Safety is our main priority and our record is second to none! Our instructors are all USPA rated. Internet access is provided. Indoor packing area with heat/AC.